I grew up with a family that supported exchange student programs. Starting in fifth grade, my family hosted students from China, South Korea, Germany, and Brazil. I loved growing up with different cultural experiences in my own house, and especially the connection and bond we made with each student. They were more than just visitors; they became family. I still keep in touch with my “brothers and sisters” throughout the world. 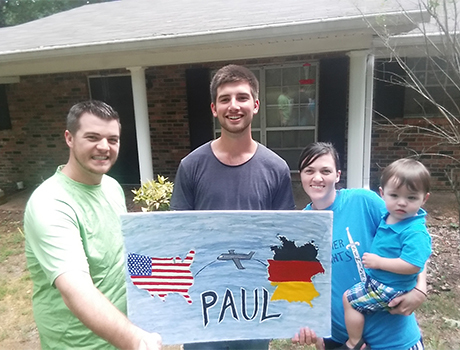 We decided to host Paul because I wanted to be able to pour into the life of an individual as my parents did, and bring a different bit of culture into our own home. Since day one, Paul has been our son. We love him and do things together with him all the time. We believe God truly blessed us and brought Paul into our lives, and we want to provide him with a great life experience as he enriches our lives at the same time. We have only been together for a month, and we feel like we have already known him our whole lives. He teaches us little things that we forget about, like the importance of being together and loving one another. We can't wait to see what the year holds for our family as we share in this adventure together.